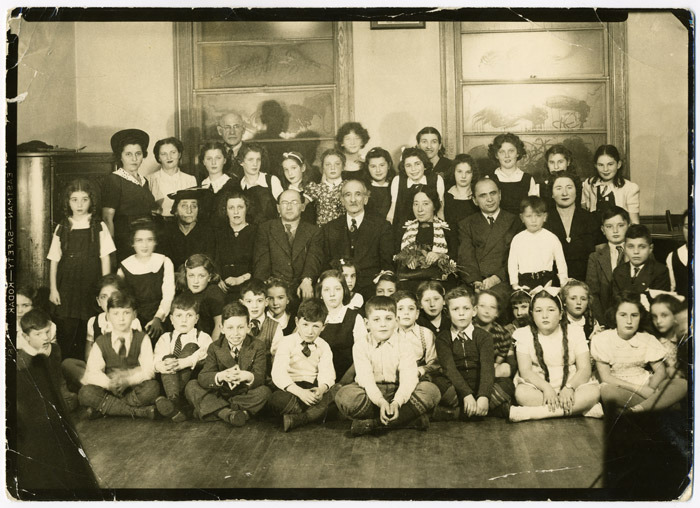 Yiddish poet Ida Maze (centre, holding flowers) with teachers and students of the Workmen’s Circle, a leftist organization that was involved in the labour politics of Quebec (November 10, 1942). The Workmen’s Circle building at 4848 Boulevard St-Laurent is now home to La Sala Rosa. The Yiddish language has been a main feature of Ashkenazi Jewish life for almost one thousand years. What started as an “internal” oral language had by the 17th Century developed to include both a religious and secular literature. Influenced by the European Enlightenment, the Jewish Enlightenment of the late 18th and 19th Centuries led to the rise of a new and modern Yiddish culture that began in the 1860’s and continued its explosive growth until the outbreak of the Second World War. In less than 100 years, Yiddish was to achieve the ultimate recognition. In 1978 Isaac Bashevis Singer, a Yiddish writer, was awarded the Nobel Prize in literature. Yiddish continues to engage new generations to this day. Eastern European Jews’ confrontation with Modernity resulted in a variety of responses: ideological, political, and cultural. Modern Jewish ideologies reflected the pervading sprit of the times with words and ideas like “folk”, “nation”, “culture”, rallying cries in countries throughout the European continent. The rebirth of Hebrew as a modern language and the efforts to establish Yiddish as a literary and national language were highlights of this period in which a modern Jewish identity was being defined. Yiddish, the lingua franca of the vast majority of Central and East European Jews, now became the vehicle for numerous political movements. The recognition and elevation of one’s own history, cultural heritage, and language became an important focus of these Modern movements. Each of these movements established their own institutions such as libraries, schools, dramatic clubs, orchestras, and newspapers. The libraries themselves were central to their growth and appeal; libraries were places where the Eastern European Jewish masses were introduced to world literature translated into Yiddish and the emerging Yiddish and Hebrew literatures. In Eastern Europe, the spaces these libraries occupied were often only a cupboard in a small room, someone’s flat, and often hidden because they were illegal. To build and participate in a new world, one needed “to know”; to know one’s self and one’s role in the world. The Jews of Montreal hungered for their own space in which modern Yiddish culture would flourish. The Jewish Public Library, or Di yidishe folks-biblyotek, met this need, lovingly fostered by devoted community members and leaders inspired by an era of endless possibilities.